Happy 2019, my friends! 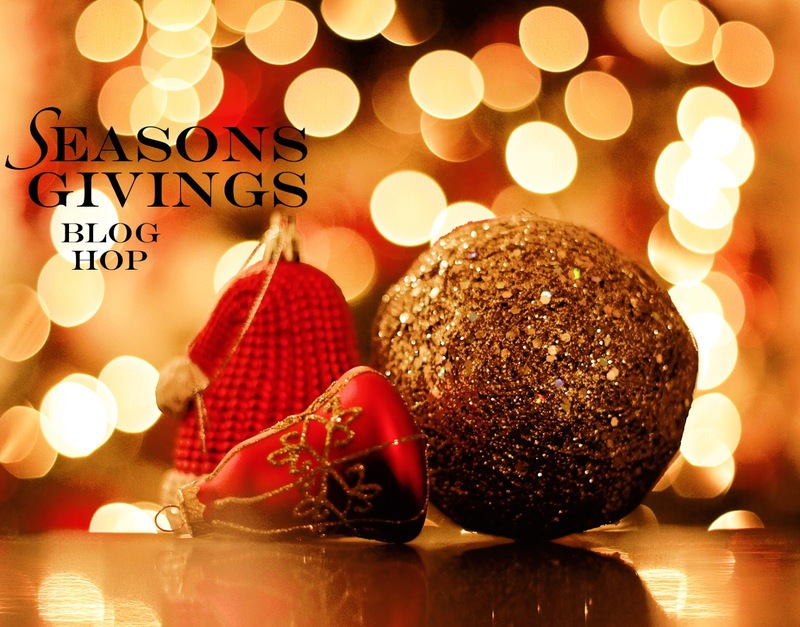 I'm excited to be a part of the Seasons Giving Blog Hop hosted by Latisha Yoast. This is a great time for me to say thank you so much for your support this year…it's been an incredible one! PRIZE ALERT: Every blog on this hop has a prize (scroll down to see mine), so be sure to enter to win…lots of free goodies to start this year out right! Here is a look back at some of my favorite projects this year. You all know how much I love a rainbow, right?!! I just love this bright, fun card. Along with rainbow colors, I adore this color combination. I absolutely LOVE the font on that sentiment too! I need to dig out this stamp set and create with it again. One of my favorite color combinations to use on Christmas cards! Click here for the blog post and another card. Thanks for taking a quick walk down memory lane with me! You all mean the world to me, thank you for being here! 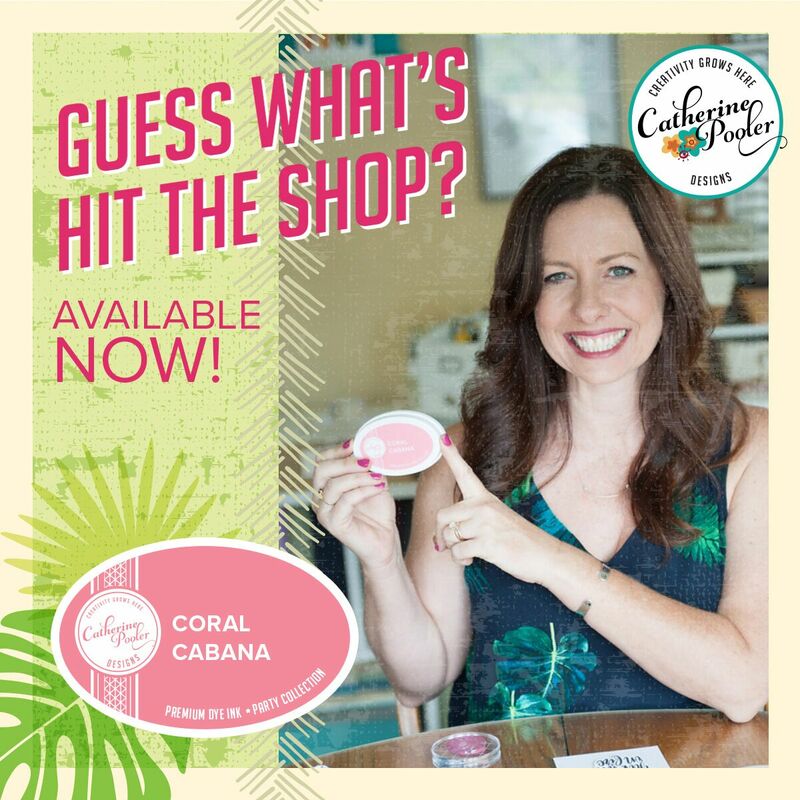 Win a set of Catherine Pooler's Spa Collection: Paradise Found ink pads! To enter just leave a comment on this post telling me if you have any of Catherine's inks & please leave your email address so I have a way of contacting you if you are a winner! Winner will be announced on Sunday, January 6th! Available to US residents only. So sorry internationals. Love your projects Kristie! 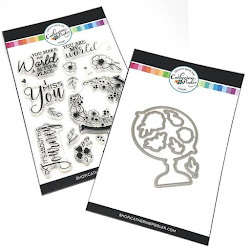 Such an amazing prize, I LOVE CP Ink, no need to add me to your giveaway, I own those ;) Just wanted to thank you for a fabulous year of inspiration! Thanks for sharing your creativity. Thanks for the giveaway. I have an US adress. Happy New Year! I do not have any of Catherine's ink. I love the colors. I have 2Catherine Pooler ink pads - just to try them out. Haven’t given them a fair test yet, but love the vibrancy of the colors! I do not have any of Catherine’s inks...yet! I admit that i have EVERY SINGLE PAD from Catherine Pooler, lol but I do teach card classes and extra pads would be super fun to have. her inks are A-MAZING!!!!!! Happy New Year! No, I do not have any of the CP inks. I do not have any of the CP inks...yet... Happy New Year!!!! I don't have any yet. Beautiful colors. Thanks for being a part of Seasons Givings! 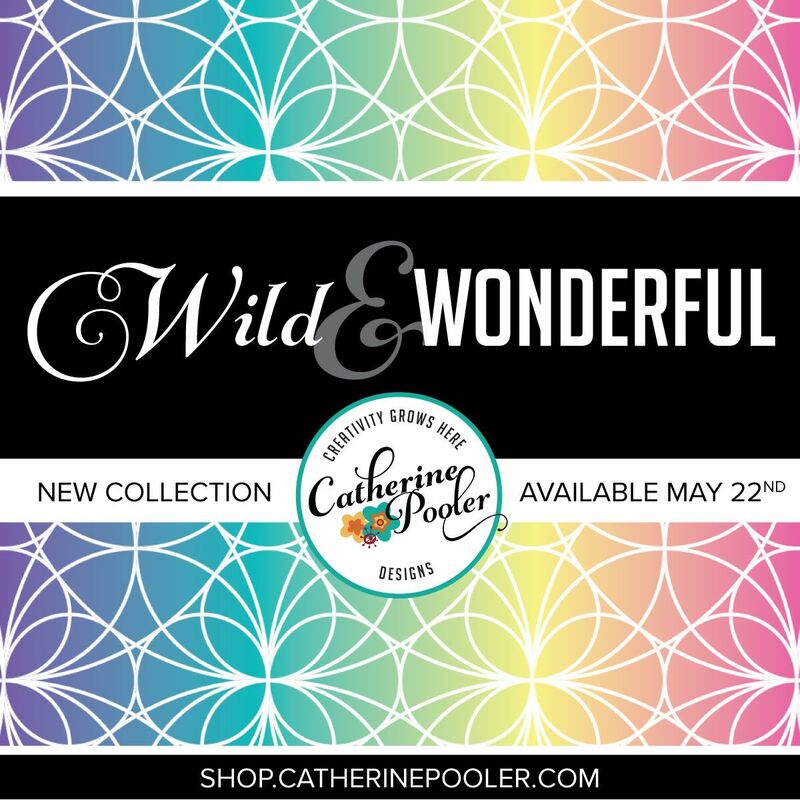 I have never tried any of Catherine Pooler's stamps, but I have heard good things about them, and I LOVE the bright colors! have a warm and wonderful new year! Happy New Year Kristie! 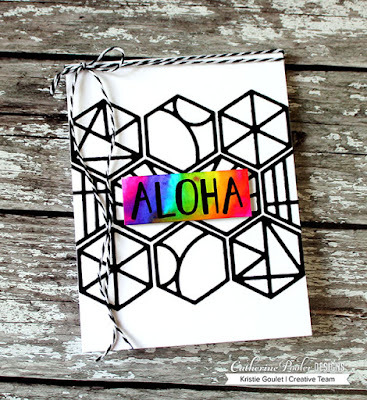 I actually don't have any of Catherine Pooler's inks, but I've been admiring them on your blog for a while! Great cards--awesome colors! I do not have any................yet! love your cards. so bright and fun. I do not have any Catherine Pooler inks at this time. I drool over the inks, but I have none. Love your card style!! I do not have the CP inks, but I have been dying to try them! I also am not in the US (Canada), but have a US address I could use. I hope that counts? Have a great 2019!! Such pretty, bright colored cards. Especially like the April 19 card. Just yesterday I was thinking I need new ink pads and started checking into ink companies. I don't have any CP inks. Maybe I will win some! Happy new year. I do have some of CP inks. They are amazing. Happy New Year, Kristie! I do have some of Catherine's inks, but none from this collection. I always love looking at your projects Kristie - the colors and graphic style really draw in my CAS loving heart. Unfortunately I do not have any CP inks but I have a set of them on my wishlist at EH. I love the bright and happy colors the most. Happy New Year ! Your Christmas card shown was a gorgeous colour combination, I do love how cheerful your cards are. 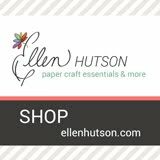 I can't be entered for your giveaway but do want to thank you for sharing so much inspiration this last year. Love your cards Kristie. My favorite is the 2nd one with the pretty flower combo and that special sentiment from His Love. Read your trick about using the back of the stamp to stamp the color, I will have to try that. Thanks for sharing with us. Happy New Year. Happy New Year and enjoyed going down your memory lane! I don't have any of Catherine's inks. Thank you do much for being a sponsor! Your first two cards are my fave color combos! A rainbow of color is always a happy sight. And red & teal blue was my new fave color combo or Christmas. All of your cards are lovely. 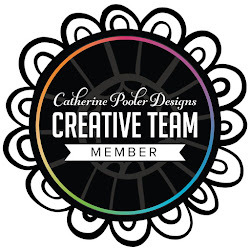 I do have a few of Catherine Pooler inks, but none of the colors you're giving away! I love her inks!! Thanks for the giveaway and Happy New Year!!! I do have some of Catherine's inks. I do not have any of Catherine's inks. I love your rainbow cards. I don't have any of Catherine's inks. I love cp inks. I have the naturals set!!! Love it. Great for everything ���� happy new year. Email Danielle.keys1@gmail.com. I just received some of these inks and love them! Best wishes for the new year! Such nice colors on your card designs! Love your cards! 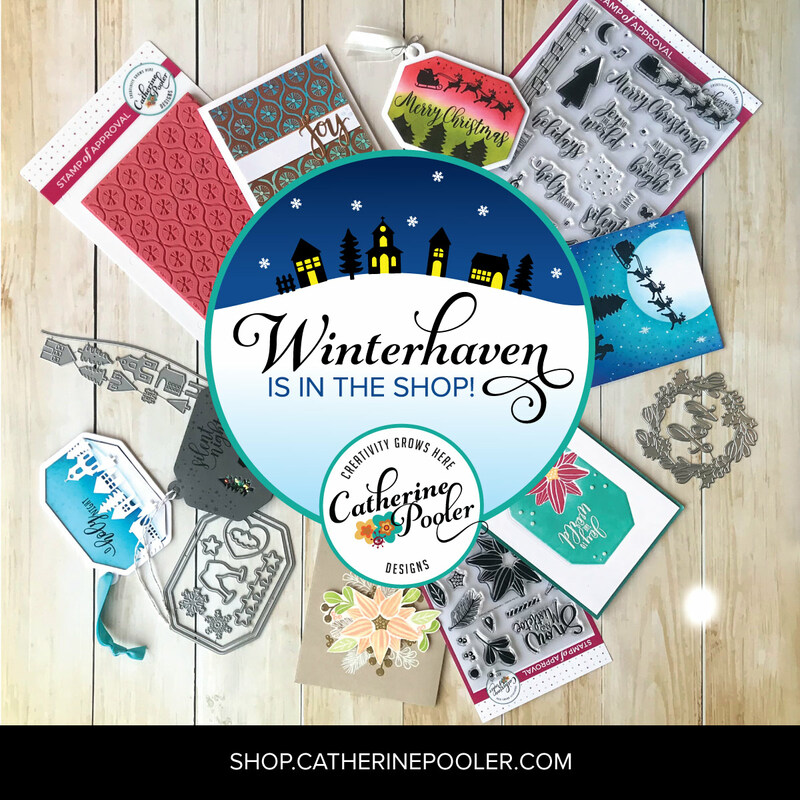 I haven't tried any of the Catherine Pooler inks, so I would love to win! Thank you! Love your cards. 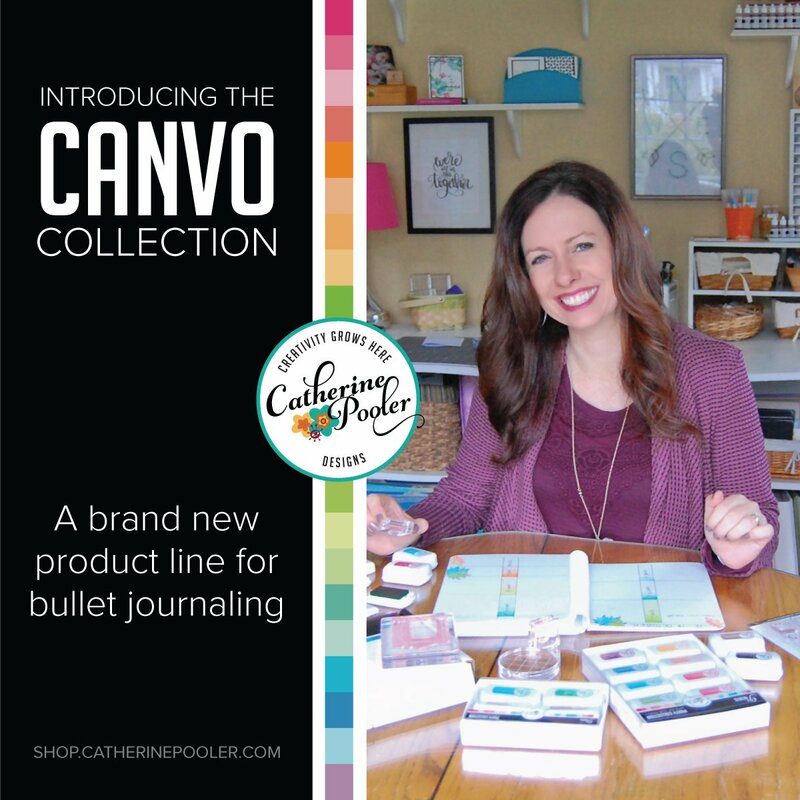 Have heard lots of praise on Catherine Pooler inks but have not had a chance to buy or try them. Winning them would be great. Fabulous cards!! I don't have any of her inks, I'd love to try them!! I haven't used Catherine Pooler inks, yet. I love the way your cards pop with color surprises! Happy New Year Kristie! Love your cards as always, you do such great work! I have not tried CP inks yet, hear lots of good things though!!! Love the Merry & Bright colors too! Happy New Year to you and yours! I do not have any CP inks but have read so many nice things about them. Yup, I have one of her first sets, Fiesta Blue, Orange Twist, Grass Skirt, Rockin' Red and the GREAT Midnight! Would love more. Those bright bold rainbow cards catch my eye! Love the use of color. Love your cards! I don’t have any of these ink pads but those colors are wonderful! Thank you for sharing your beautiful talents and inspirations. I love your style. I do not have any of these fun inks (yet). I am looking forward to trying them. Happy New Year! I Love your cards! Especially the bright bold colors you used. I am drooling over your prize (not a pretty picture...wink). 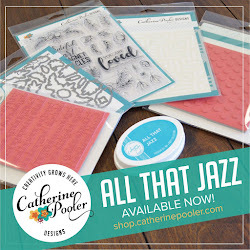 I don't have any Catherine Pooler ink pads but I have been wanting to get some. ;) I hope 2019 is a kind year to you and yours. Happy New Year! Happy New Year, Kristie! I believe this is the first time I've seen your blog. It's always wonderful to be introduced to new bloggers and inspiration. Your cards are beautiful! I've never tried any of Catherine's ink pads before, but I've heard they are fantastic. Thanks for the generous giveaway! Happy New Year! I have two of her ink pads and love them. I have a few of Catherine's inks and the are so amazing. I love them! I love your first card the best! And I do have some Catherine Pooler inks and am very impressed with them! Your work is beautiful. I have not try Catherine Pooler's ink pad before, thanks for a chance to win! Fabulous favorites from 2018! So bright, happy and fun. I do have a few Catherine Pooler inks, love the colors and how crisply they stamp. I do not have any of the Inks. First I want to thank you for your generosity. Second I am amazed at the vibrancy of these inks. I would love to try them. I don't have any of Catherine's inks, but I have some others from the same manufacturer that I love. Thanks for the chance! Happy New Year! I have three Catherine Pooler inks are really like them. Thank you for a chance to win more. Thank you for the chance to win this prize. I don't own any Catherine Pooler inks, but I did try them at a friend's place. The colours a very vibrant and they ink up the stamps very nicely. OH MY GOSH! I've been extremely curious about those Catherine Pooler inks. And a cup a? I'm about half way through this incredible hop and I'm on Yeti #3. Thank you and happy crafty 2019 to you! Love these favorite cards! I admire Catherine Pooler but have not tried her inks. Happy New Year! What a great recap of your favorites from 2018! I especially loved your aqua and orange card with the stenciled corners. A technique and color combo I'm definitely trying soon! I've not tried Catherine Pooler inks, but they've been on my list of things to try. Happy New Year! Happy New Year! Thanks for the chance to win these inks! I don't own of these stamps, yet! Glad to have found you through this blog hop. Love your beautiful cards. I don't have any Catherine Pooler inks yet. I do want to try them as I love their pretty colours. The only ink I have is the one that came in a Stamp of Approval a while back. I'd love to have more. What a shame I can not participate because I live in France! But I still wish good luck to everyone! I have heard amazing things about her inks and I'd LOVE to try them - thanks for the chance!! I haven't had the pleasure of trying your inks, but the Mandarin Spice does look good! How exciting! I don't have any Catherine Pooler inks, or many inks in general, so I'm excited to start my ink collection. I want to try her inks, but haven't yet. Oh wow, what a fantastic give away. I have one set of her inks and that's all I'll ever buy again. I love them and would be thrilled to win these colors. I'm in the USA and you can reach me at alfwilk@yahoo.com. What a wonderful giveaway!!!! I don't have any of Catherine's Pooler's Ink. I have been wanting to try them . Gorgeous cards! I especially love the birthday card with rainbow colors, and your classy Merry and Bright holiday card! Gorgeous! I have a few of the CP inks and I love them! I don't have any of the colors in your prize package though! All of your cards are so beautiful. Thanks for sharing. 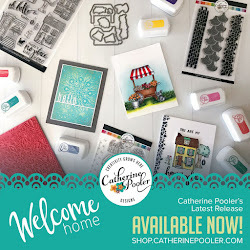 I have never tried Catherine Pooler inks! Happy New Year! ah man! i have been going back and forth and trying to save up the money for the CP inks. at this point, my birthday is Jan 24 so i'm thinking maybe the minis set. do i WANT these inks?? OH YEAH. do i have these inks? um, no. sigh. Thanks for the inspiration. I would love those inks. The colors are stunning! Beautiful cards! You are so creative! I have not tried CP's inks. Thanks for the fun and happy 2019. I loved the first card the most though the other two are also gret! 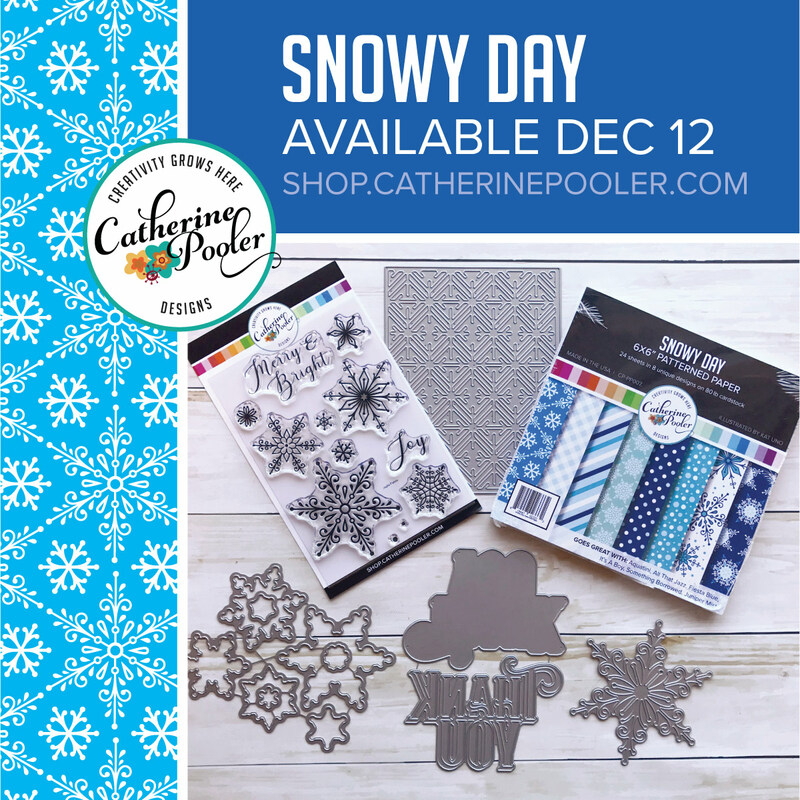 I do not have any Catherine Pooler supplies yet. 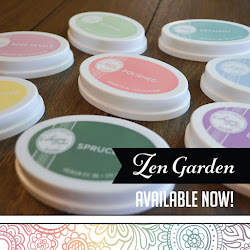 I had never heard of these inks, I'm afraid to check them out now.. My wishlist is so long already..
Love your cards! I don't have any of the catherine pooler inks but these colorsare great! Thanks for the chance to win! Great cards! I have one ink pad from Catherine Pooler. Happy New Year! Beautiful cards, The second card is my favorite - The colors are wonderful and the sentiment is just perfect. I appreciate your creativity and the generous giveaway! Happy 2019! Looking forward to seeing more of your creations! I don't have the CP inks. Would love to try them. I don't have any of the CP inks, so winning would be a great way to start a new collection. I think you shared some great cards. Thanks for the opportunity. So pretty. Love the pops of color! Just started trying out the CP inks and love them. Your cards are lovely! I have the CP Foundations. I love them and want to add more to my collection. trcuth (at) gmail (dotcom). Hi there! Your projects are so fun! What a great prize! I do have a couple of her inks. I am always surprised at how juicy these ink pads are since most ink pads are not like that. They provide great ink coverage especially for background stamps. Thank you for the opportunity to win. What great cards! Loving this hop! Thank you and I do not have any of Catherine's inks! I do not have any Catherine Pooler inks, but hear they are wonderful. The colors are so pretty. Thank you for the opportunity to win them. Your cards are lovely. Thanks for the inspiration. Happy New Year! What great cards with nice pops of color! 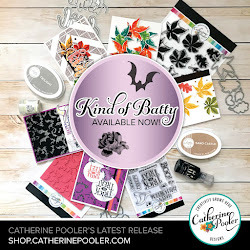 I don't have any Catherine Pooler stamps but have heard they are amazing! 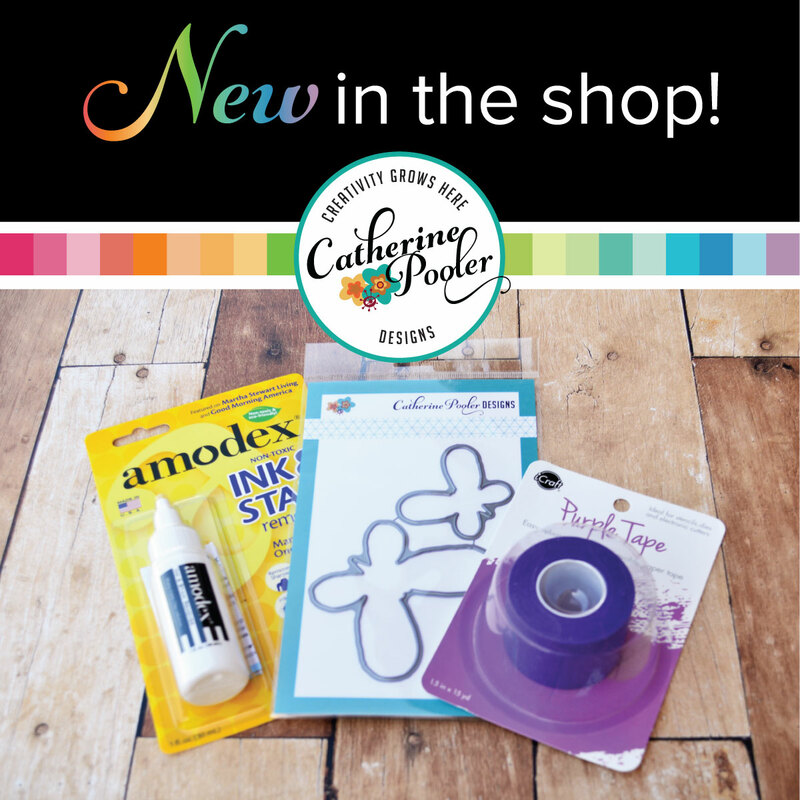 YES, I have Cafherine Pooler Designs Ink Pads and I LOVE THEM! 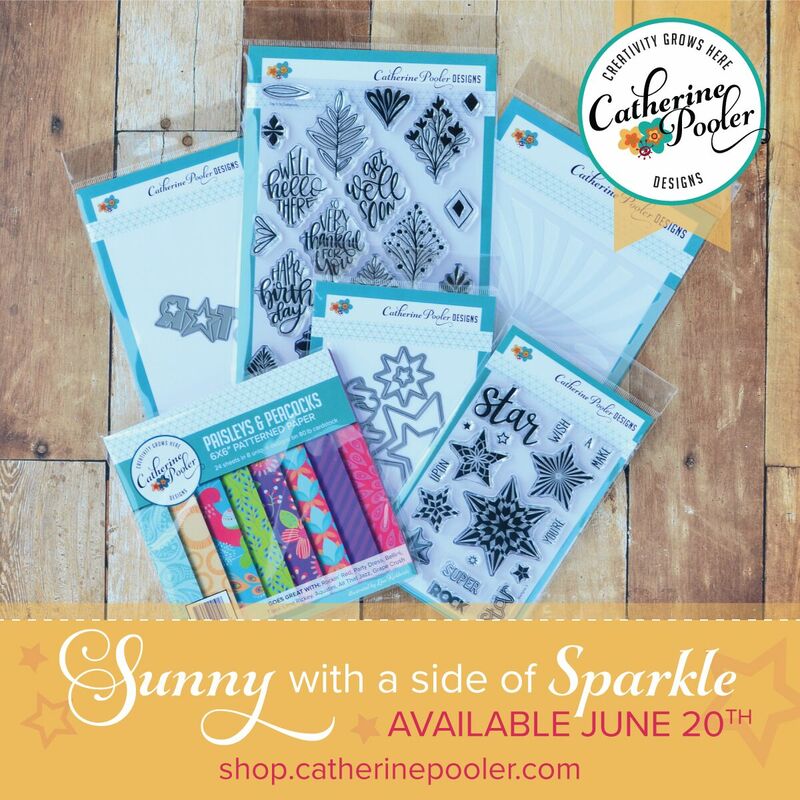 I have this Catherine Pooler's Spa Collection: Paradise Found ink pads!p on my wish list. Thank you for your generosity and Happy New Year, Kristie. I don't have any Catherine Pooler inks ~ yet~ thanks for the giveaway and the inspiration you provide. HAPPY NEW YEAR!! Wonderful cards, thanks for sharing!! 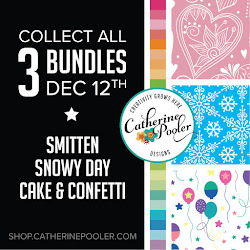 And no, unfortunately I don’t have any Catherine Pooler inks, but I would sure like to try! Happy New Year! Great cards - I especially like the Merry & Bright one! I don't have any of Catherine's inks yet but I've drooled over them in the past!! Thanks for the opportunity to win! Hi! I'm new to your blog and no I do not have any of Catherine's inks yet! Lovely cards. I love the Merry & Bright one. Thanks for the generous prize offer. 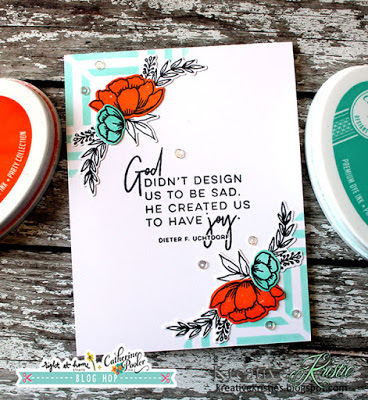 Thanks for participating in this amazing blog hop and sharing your lovely card creations. I don't have any of Catherine's inks but I do have her stamps and they are wonderful to work with. Thanks for your generous giveaway. Happy New Year! I have only a handful of Catherine Pooler inks. Thanks for the chance to win! I do not have any of those colors. I love seeing designers' favorite projects. It gives me a little peek into their mind. I have the Zen Garden set of CP inks, so I've been saving up for the Paradise Found collection, because I need to complete my set! That and the Juniper Mist ink looks like the most amazing navy, and that's my favorite color. Thanks for sharing with us and the chance to win, and here's to you in 2019! I do not have any Catherine Pooler inks. 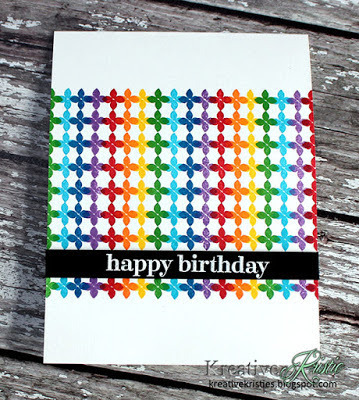 Love your card with lots of colors. What a great prize, and thank you for the opportunity to win! I don't have any of Catherine's inks and would love to try them. No I don't have any of Catherine's inks. I would love to win this package! I've got her Midnight black ink but haven't been very happy with it so far (extra juicy and made a mess when I tried it). I'm going to play around with it some more and see if I can't get it to work better because I've read nothing but great things about all of her inks! What fabulous cards! I love the bright colors; so fun!! I do NOT have any of these inks, but I have heard they are amazing! Thanks for the chance to win. I don't have any of the CP inks as yet, since I have so many other brands, but her colors are so gorgeous that I am seriously tempted! Thanks for the chance to win a set. Thanks for sharing your lovely projects from the past year. I do not own any of these inks as yet. Thank you for sponsoring this wonderful prize and happy new year to you. I have some and I love them! Great colors on your cards. I have not tried these inks yet. What a beautiful array of cards! I don't have any Catherine Pooler inks yet. I have been trying to decide what inks I'll switch to as my ctmh pads dry up. Thanks for the chance to win! Happy New Year! I have some, they are awesome! Kristie, these cards are spot on and just my style. 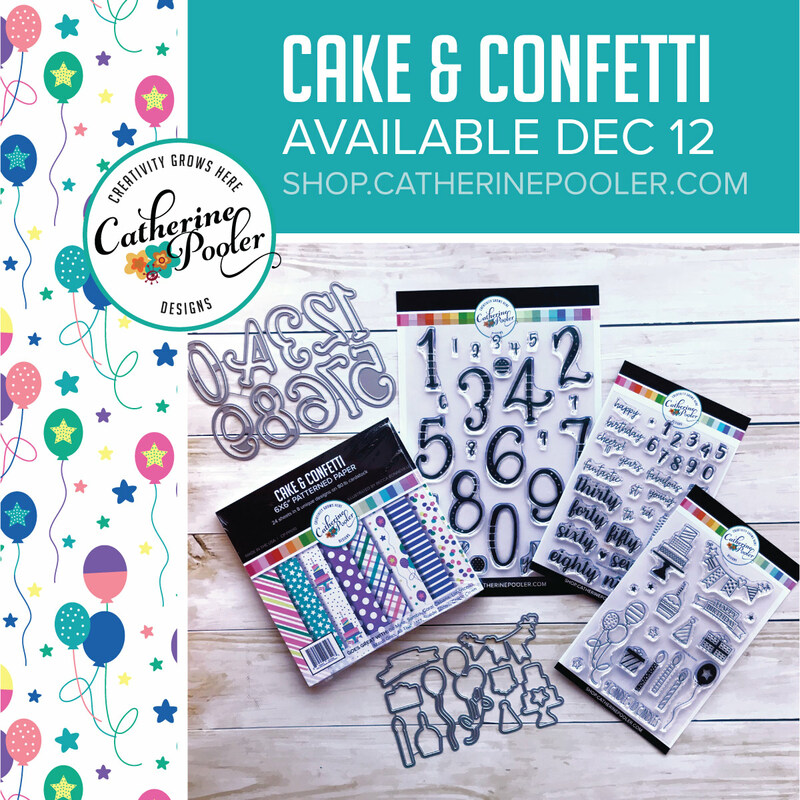 Thanks for the chance to win some Catherine Pooler inks! They've been on my radar to try them after seeing the success you've had. Happy New Year! I love your cards and everything Catherine Pooler! I have several of her inks but I want them all... I just cannot afford them right now... Happy New Year to you and Catherine! Your cards are great! I love the sentiment on that second card. It has a lot of Truth to it. I do have some of Catherine's inks. I won three of them on a you tube hop. I do not have any of Catherine's inks but I have heard they are awesome. Happy New Year! Unfortunately I haven’t purchased any yet but the colors are beautiful.